The movie Philomena, raised more questions than it answered. And so my research began. But now, one month later, I am left more confused than when I started, and feeling as though I wasted my time trying to understand the real issues behind the movie. Online, some critics railed against the hatefulness and bigotry fostered by the movie. Others justified intolerance in the guise of supporting the mothers separated from their children. Bias was even evident in the few instances where the writers provided historical perspective and background. 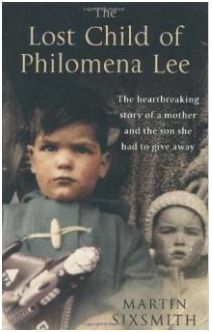 With the hope of learning what really happened to these Irish mothers and their children, I decided to read the book, Philomena: A Mother, Her Son, and a Fifty-Year Search by Martin Sixsmith. Surely the book would provide the investigative reporting to shed light on the issues hinted at in the empathy-triggering Hollywood version of Ms. Lee’s story. For me, the book provided no more insight than the movie. I was seeking information about Philomena Lee, her relationship with the Catholic Church, and a historical accounting of adoptions yesterday, today, and tomorrow, in light of societal and Vatican changes. Instead I read the biography of Anthony Lee’s life as Michael Hess, a story of a gay man who lived life loved by many, but because he never succeeded in finding his mother, he never found himself. Don’t get me wrong, the book was not poorly written. Nor was it overly graphic, even with Hess’s exploration of his sexuality. The relationships in the book were well written, and the impact of our choices on other people’s welfare is an underlying theme. But the book did not deliver what I was seeking. For a moment though, I must consider the words that Philomena Lee as the mother of a son lost to her forever, might want to see. Ms. Lee now has a historical accounting of her son’s life; the people he loved, the family that raised him, and the friend-sister with whom he shared his life’s journey. As a mother, if I was Ms. Lee, I would read and reread this book, and I would love my son. However, this book left my questions unanswered, and left me wanting no more. That is sad. I still believe that there is an investigation to be completed, but for this blogger, I have had enough. I hope that someday, someone will deliver an account of what happened to these Irish mothers and their children so many years ago, and in doing so tell us whether adoption proceedings have now changed for the better. Obviously the movie portrayed a different face of the Philomena story; more from the point of view of the mother whose complicated relationship with the Catholic Church left her almost paralyzed from investigating what happened to her son. It was the (hero) journalist who got to the bottom of the mystery, and revealed the story of her adopted son’s life after he was dead. The Magdalen Sisters’ homes for ‘wayward’ girls in Ireland, have been fairly well researched and both a documentary and movie have been made about them. I take it this was a similar story, but I know that many of these abusive institutions were closed down in fairly recent history. There is much of the history of the Catholic Church involving abuse of children that is only coming to light now. Sad but true and long covered up. I am now happy that I saw the movie rather than read the book–sounds like I inadvertently made a better choice! Thanks for the heads up.